The Easter bunny won’t be the only one hopping into Johannesburg this Easter as Beatlemania On Tour will be bouncing around stage when they kick off their week-long tour run in Sibaya Casino over the Easter break from 29 March to 8 April 2018. Tickets are on sale now at Computicket outlets or computicket.com. With several exciting additions, fans can expect a fresh experience with state-of-the-art updates to production and lighting and revamps to the show’s huge repertoire of replica Beatles costuming. This exciting rendition brings a new cast for the show’s first tour in Johannesburg since late 2010/ early 2011. In fact the cast, of Cameron Charters (as Paul McCartney), Zac Coombs (as John Lennon), Brent McMullen (as George Harrison) and Ben Harper (as Ringo), have gone that extra mile to make the show true to life. 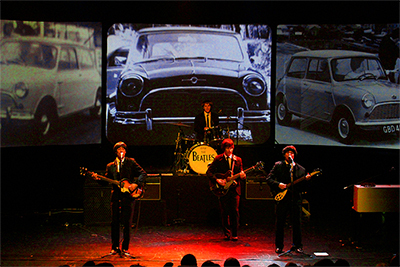 With Zac Coombs being named after Starr’s son, Harper being a left-handed player on a right-handed drum kit – like that of Ringo – and Charters even teaching himself to play bass left-handed for his role, the cast members bring an extra flare to the show to set them aside from other Beatles tribute bands.